In the weeks since my last blog post, Dr. Gosnell and I have made several amendments to our original research plan. Currently, much of our time has been focused on a study we began in the Spring of 2018 which focused on the effects of interpersonal experience. During the “in lab” portion of this study two participants are invited to take an online survey assessing the participants initial mood. After the survey, the participants take part in two interactive conversations. The first conversation focuses on an impersonal topic, and the participants are expected to maintain the conversation for three minutes. The second conversation requires one of the participants to share a personal experience and for the second participant to relate to their partner, offering support or asking follow up questions. This conversation is then coded based upon the participant’s conversation; their world count, word choice and general participation are all accounted for. This study serves as a basis for our Spring 2019 study. We are currently proposing a study based on the effects of support provision via social media, specifically Facebook. Similarly to our Spring & Fall study, students will have the opportunity to provide support “in the moment.” Where the new project differs is its focus on memory and retention of prior support that is both shared and received. Facebook, in addition to other social media, serves as an archive of shared information. Ultimately, Facebook serves as a sort of repository for information sharing and the exchange of support. This will allow us to track the effects of provisional support over a period of time, rather than just assessing the support provided during one, hypothetical conversation. Dr. Gosnell and I communicate each day via email, meeting in person every few weeks to discuss progress made on the IRB proposal. This coming January Dr. Gosnell and I will meet weekly to narrow the focus of our study and enumerate the in-lab portion of the study. Thus far, communication has been one of the most necessary steps in making continuous progress in this study. We plan to continue to revitalize this study to incorporate any additional stimulus, while narrowing the scope to allow for the most accurate and concentrated area of study. Over the course of the last few weeks, it seems that every major newspaper, tabloid and television network has been splashed with headlines pertaining to Harvey Weinstein’s accusations. 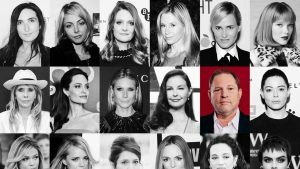 Since the first allegation against Weinstein was pronounced in mid October 2017, 77 other women have come forward to state their claims of harassment, sexual assault or sexual abuse against the renowned Hollywood producer (Bennett 1). Today, these women’s claims are met with support, tolerance and overall acceptance. This likely would not have been the case if these same allegations were made only a few decades ago (Bennett 1). For most of American history, straying outside of expected gender roles was met with discomfort and disapproval. Gender roles are behavioral expectations of males and females, which are largely affected by cultural values. As time progresses, our culture becomes persistently less rigid in our assigned gender roles (Myers 146). The definitive expectations of women in the kitchen and men in the office become less and less substantive with each passing year. With that, the expectation of men’s aggression and dominance, paired with women’s femininity and submission diminishes as well (Bennett 1). In the article, “The ‘Click’ Moment: How the Weinstein Scandal Unleashed a Tsunami,” published by the New York Times, the author laments on the changes in gender roles, expectations and acceptance within our culture. In 1977, the term sexual harassment had not been legally defined. In that same year Mrs. Magazine published a magazine cover with puppets portraying sexual harassment; it was banned from grocery stores. Women during this time period were often sexualized, and expected to remain submissive during their objectification (Bennett 1). 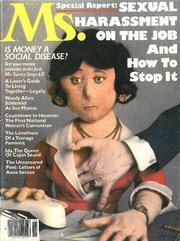 The Mrs. Magazine front cover portraying sexual harassment. Since then the expectations of male and female behavior has changed drastically. Women have a far stronger presence in business and men as stay-at-home figures. These changes are taking place across nations, and over a notably short time span. This indicates that the changes seen in gender roles and expectations may not be a result of evolution or biology, but simply time and human influence (Myers 148). One contributing factor in this development is very likely the influence of minority influence. Within the concept of minority influence, it is evident that cultural situations mold us, similarly to the influence of defined gender roles. If one individual strays away from the common norm, many others may follow suit (Myers 235). Slowly we find that the minority may evolve into the new majority. Thirty years ago a woman who came forward with claims of sexual assault was often dismissed, today it was met with not only support, but a large battalion of women who had faced a similar battle. Two main factors of minority influence are consistency and self-confidence (Myers 236-237). When a minority remains steadfast in their stance, it becomes far more influential. Consequently, consistency and persistence convey self-confidence. Any behavior by a minority that conveys self-confidence raises self-doubt among the majority (37). In the case of Harvey Weinstein, women, in particular those speaking out against sexual assault, were once firmly in the minority. Through self-confidence, consistency and persistence we have seen women (and men) overcome gender roles and evolve from minority to majority. While cultural appropriation may normally be slow, there is one factor that greatly attributes to this. Minority slowness effect- the concept that it takes people with minority views far longer to express their thoughts than those in the majority (Myers 236). This likely attributed to why it took women years to come forward when revealing their stories of sexual assault. Gender roles often define the ways in which people are expected to conduct themselves in a work environment, in the household and, ultimately, in the midst of an unwanted sexual advancement (Myers 89). These expectation and presumptions have diminished greatly as we progress into a more accepting society. This is likely the result of minority influence, further proof that the minority may eventually overwhelm the beliefs of the majority when persistent and confident. Perhaps with the assistance of minority influence, the disparagement of those who wish to expel their gender roles and expectations will cease to exist.